This entry was posted in Ecuador, Landscapes, Photography, Reflections, South America, Sunset, Travel and tagged Ecuadorian Amazonia, reflections, sunset. Bookmark the permalink. Nothing better than a beautiful sunrise or sunset! Wonderful capture, Ravi. You are so right Donna. Thanks. Wow! Spectacular is an understatement. Thanks Pat. It is mesmerizing. 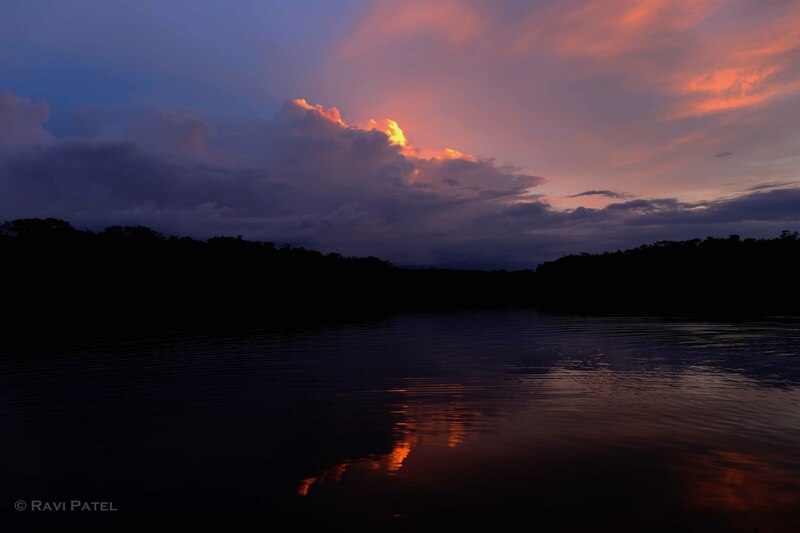 That is an awesome picture – the vibrancy of the clouds reflected in the peaceful lake waters! It gives the feeling that if we wait a few minutes the lake will be coming to life! Very well described. Thanks Rupande. Ellen, that is so kind of you. Fantastic stormy sky. Rich colour.